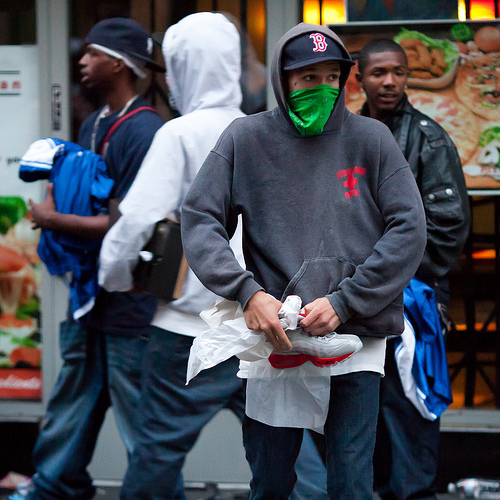 Photographer and blogger Thomas Hawk is helping the Oakland Police Department apprehend looters. He didn’t agree to that, mind you. When reading a San Francisco Chronicle article about police trying to track down looting suspects in the aftermath of BART cop Johannes Mehserle’s manslaughter conviction, Hawk recognized his own photos in the batch. It seems that, to aid their police work, the Oakland PD took photos off Flickr from the riots and released them to the media. Does it seem weird to you that law enforcement are essentially breaking copyright law to aid in their police work? How hard would it have been to include the photographers’ names with the photos?